We develop the most powerful 2D and 3D Aerodynamics software running on MS Windows Laptops and PCs. Stallion 3D with HIST is the go-to software for accurate aerodynamic performance information about new and existing designs. It predicts lift, drag and moments for your CAD models and quickly advances you to the next stage in the design process. Stallion 3D solves the compressible Reynolds Averaged Navier-Stokes (RANS) equations directly on the solid model (STL file). Grid generation is completely automatic. Stallion 3D is an all-in-one 3D aerodynamics package for MS Windows 7, 8 or 10. 3DFoil is the fastest way to design and figure out the size and aerodynamic performance of 3D wings, tails, canards, sails and hydrofoils. Use the built-in editor to design and compute lift, drag, moments, longitudinal & lateral stability derivatives. The novel vortex lattice approach (HVLM) computes both profile and induced drag to provide an immediate accurate verification of your design. MultiElement Airfoils is the best solution for designing and analyzing flaps, spoilers and ground effect devices. Analyze airfoil shapes, gaps & angles for best aerodynamic performance. MultiElement Airfoils is ideal for high-lift, F1, FSAE & racing. 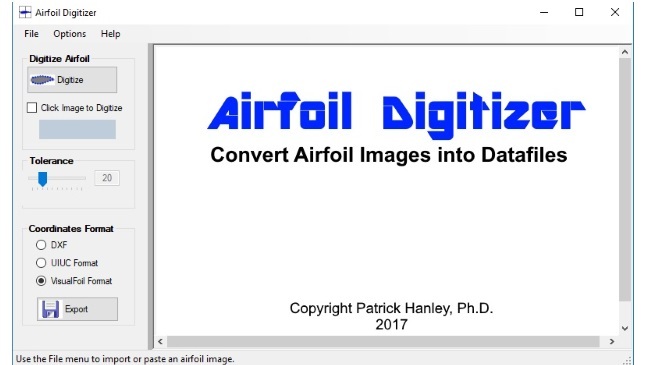 Airfoil Digitizer converts images from the Clipboard, JPG, GIF, PNG, TIFF to DXF, UIUC and VisualFoil formats. Convert pictures from CAD drawing, text books and reports to data files that you can analyze in any CFD software. The Aerodynamics Toolkit is a suite comprising of 3DFoil, MultiElement Airfoils (Lite Edition) and VisualFoil 5.0. It provides the tools needed for your rapid conceptual aerodynamics design and analysis.